Love how our holiday card came out this year! It's a good thing I got my holiday cards done and sent out. It's usually such a source of stress for me and Steve, because it requires a photo-shoot of some kind whether it's setting up the timer on the camera so that we can take a picture of ourselves (never comes out great, right?) or finding someone to take our family photo (Maureen, you're amazing! ), and then picking out a card to go with said picture, waiting for the cards to arrive (it feels like it takes forever), and then addressing the envelopes (I really need to create a master spreadsheet of all loved ones addresses) and sending them out in a timely manner. Well, this year, Minted totally came through for me! Granted, they've got such a great selection of holiday cards that the hardest part was picking just one! But we were able to find one that best suited our family photo (thank you Maureen!) and it all came together really fast. One of the best things about their website is that you can plug your photo in and see how it would look in all of their cards while you're browsing. Did I just blow your mind?? YEA, how amazing is that? That makes it all the more easy to find the right one for your photo. They also have really amazing promos going on between Thanksgiving and Christmas (still do!) that it was a no-brainer for us to order them asap. And they also print addresses on the envelopes for free! As you can see above, we chose the Winter Botanicals Christmas Card and love the vibrant design and colors of the card. It's got this whimsical, wintery wonderland feeling and comes in 4 other color ways that you can choose from to better suit your photo. 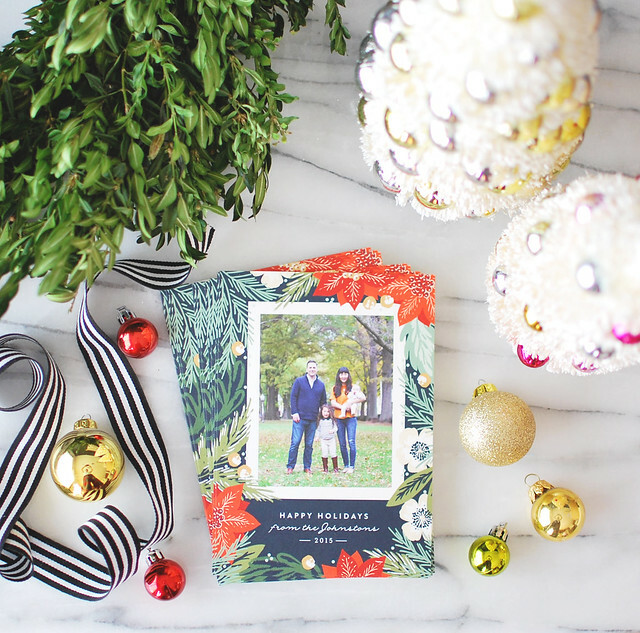 We instantly gravitated towards it and are so happy with how our holiday cards came out! With the slight exception of my hair, but I won't go into that because that would make this post entirely way too long and then you'd stop coming to the blog. Right now, Minted is offering express service cards by 12/18 with free expedited shipping with code: SHIP. If you're not in a hurry, enjoy 15% off holiday cards with code: WINTER15. So if you're anything like me in the past years, you haven't gotten your holiday cards done/sent out yet, so head on over to Minted and find the perfect holiday card to send out to your loved ones. This post was in partnership with Minted. Thank you for supporting the brands I love to keep this blog going!